The simple truth is that chocolate rocks. It seems to hit the a very special pleasure center in the brain. Our "Festival of Chocolate" AKA Valentine's Day has the stores are filling up with heart shaped boxes, bags of Kisses, and tons of truffles. It shocks me how much chocolate is bought and consumed just from my grocery store (forget the entire country!). Most of this chocolate is not the best. It is filled with sugar and oil, and it doesn't resemble the dark chocolate that I have grown to love. I don't really think of high quality dark chocolate as candy. Dark chocolate is more like a gourmet treat best savored slowly. The problem is that it is hard to stop at just one bite. Chocolate is very high in calories (120 calories per ounce) and it is easy to over do it. How about using it for dipping? Drizzle a wee bit of chocolate on a pretzel stick and you manage to get some chocolate without consuming an entire bar. This is a "treat" and not a healthy snack but compare it with a Snickers bar - and you are doing great! These are fun and fast to make (my kids had a ball). All you need is a little time to wait for them to harden up. Put them in the fridge if you are in a hurry. It is important to store these in a container or they will go stale. I used Ghiradelli dark chocolate chips and ate one of these at my afternoon coffee break. YUM! Place a sheet of wax paper (or parchment paper) on a cookie sheet. Melt chips in a small bowl in microwave (use 10 second increments to ensure they don't burn). 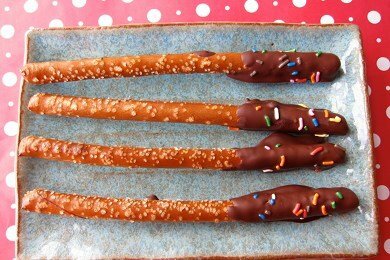 Dip pretzel into chocolate and use a small spoon to drip the chocolate along the stick. Place on cookie sheet and add sprinkles. Allow to dry (about 15 minutes) on the counter or put them in the fridge. Store them in a closed plastic container or plastic wrap to keep them fresh. I make these every year for V-day! I love them! Nothing like salt and chocolate together! What about Crio Bru? I love sipping my dark cocoa! They're cocoa nibs made for brewing in a french press. NO sugar unless you add it (which it doesn't need!) and as dark as you want unless you start adding cream (which I limit to 1 tablespoon :-D) I'm not a coffee drinker so it's perfect for me. Check it out! May son gave his wife a bag and press for valentines last year. Heavenly! What a great treat! Just a touch of chocolate can go a long way. I have made this recipe for my homemade granola bars and instead of using the mini chocolate chips, I have drizzled melted chocolate over the top. A little goes a long way. You have a healthy snack and it is quite a treat.